If you’re building a new company career site, here are 15 features for you to consider to attract, engage and convert candidates. 1. A Compelling Headline— It’s a shame that most company career home pages use just “Careers” or “Jobs” as their headline. Boring. Instead, write like a copywriter and be attention-grabbing (Huge Inc.) or Activision (pictured below), focused (Pivotal), or leverage social proof (Salesforce) in your headline (see #9 below). If you can’t settle on one headline, take Eventbrite’s approach: Their headline is like a live ticker and rotates as you watch it — it’s tough to want to click away. 2. Easy-to-Find Job Descriptions — Job descriptions are the most vital content to candidates and my rule of thumb is if a candidate can’t see how or where to view your job openings within 2 seconds, you’re failing. Hootsuite has their current job openings directly on their careers landing page. 3. Clear Calls-to-Action — What’s the main thing you want your candidate to do? Eventbrite, for example, gives you 2 main calls-to-action: A) “View Open Positons” and B) “Keep in Touch” (talent community). Global Telesource’s 2 calls-to-action are: A) Schedule an interview with a recruiter and B) Interview right now (video interview). SnackNation’s 2 calls-to-action are: A) Watch a video and B) View jobs. 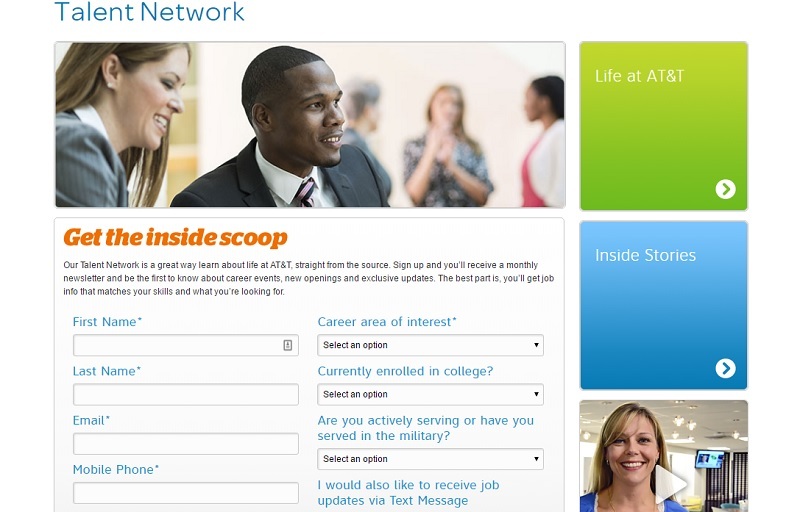 It’s an interesting exercise to see what your existing career home page call to action is by conducting the squint-test: squint while looking at your careers site home page and see what graphical element jumps out (that is what the candidate sees as your primary call-to-action — is that what you want them to see?). 4. Videos — Career site videos can be compelling. Making them short (under 60 seconds) is recommended (Hootsuite’s got a few and each is only 16 seconds) as candidates drop off after 60 seconds. And it’s ok to have a straight up commercial video as long as it’s supporting a theme that matters to candidates. 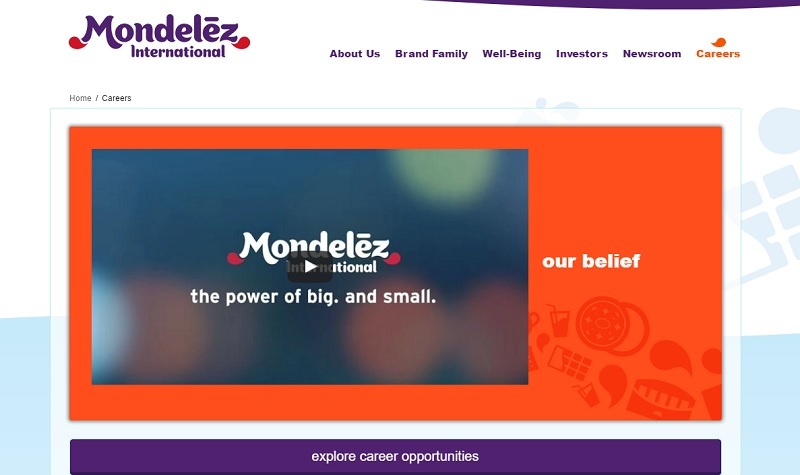 Mondelez International does a good job at this with their theme of “big and small”. Morton’s Salt’s video is all about its brand and history and does an amazing job of making a commodity product feel special — that’s what video can help do when you nail it. 5. Talent Network Opt-In — We touched on having a join talent network call-to-action in 5 Calls-to-Action to Make Your Job Descriptions More Effective blog piece. It’s important to have an option for those who don’t apply right away. You can give the names and email addresses to your recruiting team and nurture these potential candidates with content on your company careers and current openings. 6. Mission — If you have a solid mission statement, consider putting it on your careers home page front and center. Check out Chipotle’s careers home page (they put it right below their headline). AOL puts it lower on the page. Millennial candidates in particular love to hear the purpose/mission of your company. 7. Values — If your company has specific values then you should show that on your career home page (Pivotal) millennials and most people place value on this. 8. Careers Blog — Some employers have their own blogs just for the purpose of careers. Goldman Sachs, for example, features employee Q&A’s, company views and initiatives. While Microsoft has a highly designed people-centric blog. Target, for example, shows off in one post that they are “Preparing for Interns Coast to Coast” (1,000 of them)– if you’re an intern, that would catch your attention. 9. Social Media Buttons With Action — Most company career sites have simple icons or links to their social media channels. Goldman Sachs has clear social media calls-to-action (“Follow” us on Twitter and LinkedIn, “Subscribe” on YouTube, “Add us” on Google — it’s subtle, but such action-oriented call-to-action words typically work better than a simple social media icon. 10. Top Reasons to Work for You — Many employers have a “Why work for me?” section and that’s fine. But in copywriting, words matter and if you have a headline called “The Top X Reasons Why to Work for [You]”, that is the type of headline that typically converts well. Comtrade offers this right on their career home page with “10 Reasons To Work for Comtrade“. Autodesk famously did a skunkworks project in which they listed the “Top 7 Reasons You Should Work at Autodesk” and got 1.6 million candidates to view it (and counting!). 11. 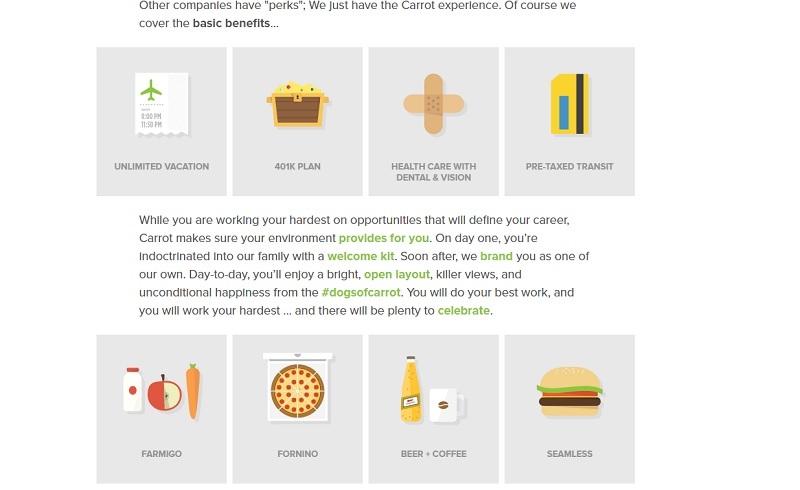 Perks — Carrot points out on its home page that every new employee gets a “welcome kit” which is an app on an iPad (“which all new Carrots receive”) to tell you about their policies, door codes and more. Yahoo says we put our employees first section directly on their career site home page. 12. Number (#) of Jobs — You should be upfront about the # of job openings you have and if it’s a decent # (50 or more) I personally recommend you share that as early in the candidate process as possible (Houghton Mifflin and Pivotal). This gives candidates the idea of scale of the company and which departments are most important. Pivotal even includes the # of jobs on its locations too, some candidates are going to be attracted by how many different offices they are hiring. 13. University & Student Section — It’s important to appeal to people looking for an internship or a position straight out of school (some of your most impactful talent can come through this way). We’ve seen an increase in University and student sections on some of the biggest employers career sites including Google, Facebook, and Amazon. 14. 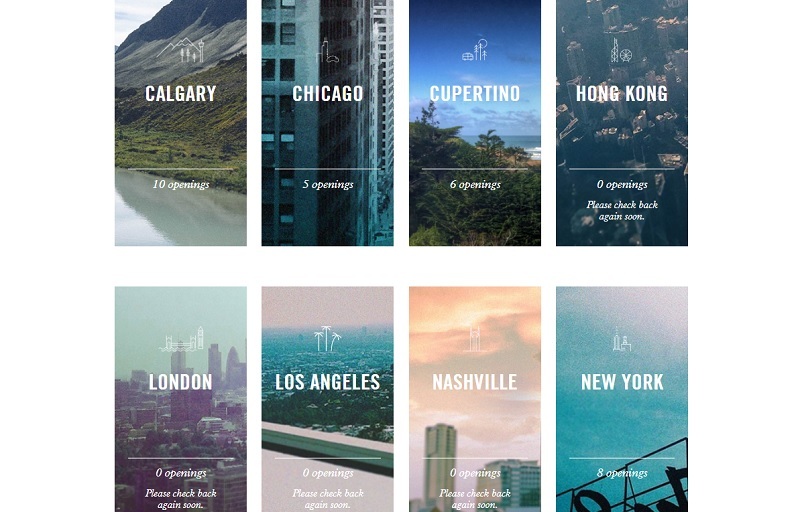 Microsites for Locations — Many candidates (especially ones who have not heard of you) will be attracted to you for your location (whether because they live there or are able/want to move there). Check out Critical Mass (pictured below), Huge, and Atlassian. 15. Microsite For Departments — Another microsite that is useful for job seekers is job openings for certain departments. This makes filtering through positions much more convenient for candidates especially if your company has a massive amount of job openings. Hallmark (below) features its different department microsite off its careers home page. Social Proof — Talk up your careers page with social proof: employee testimonials, seals of approval (best place to work, Glassdoor top employer, etc.). Show off: you’ve earned it! Salesforce (below) uses it as their headline currently. Activision does one of the best jobs of this. Career Site FAQs (Frequently Asked Questions) — Odds are job seekers and candidates will have at least one question whether its about the hiring process or working at your company, so having an FAQ will help keep the candidate engaged instead of clicking off somewhere because they feel it will take a long time to get an answer. UPS (below) has two FAQ sections covered. **Update — If you find this article valuable you might also enjoy The 20 Best Company Career Sites (and Why!) and 20 Creative Ideas for Your Company Career Site. Do you have a favorite company careers site idea that we missed? If we missed a great company career site idea you think stands out, please comment on it below and we’ll make sure to add it to this or a future post. Thanks!